Gov. 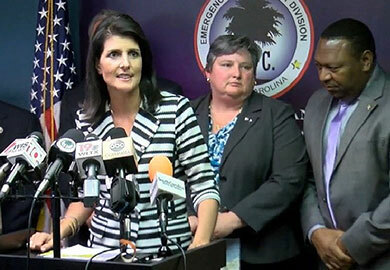 Haley has declared a state of emergency for South Carolina and coastal evacuations will begin Wednesday. After declaring a state of emergency this morning, Gov. Nikki Haley addressed the state regarding Hurricane Matthew and has closed multiple school districts and state agencies within those districts for the rest of the week. Please take note of the below information and continue checking the SCDNR website for updates regarding SCDNR closures and cancellations, news releases from multiple entities, weather advisories, hurricane preparation, and evacuations. More than 1500 law enforcement officers, 712 troopers, and 1800 National Guardsmen will be working throughout the state to ensure successful road management and the evacuations of coastal cities, which will begin tomorrow. Residents in the following evacuation zones should make preparations for potential Wednesday evacuations beginning at 3 p.m.
Those being evacuated are advised to fill up their vehicles with gas, take any important paperwork with them, notify family, stay on evacuation routes, and drive at least 100 miles away from the coast. People are encouraged to check on their neighbors, especially those who have children and those who are elderly, and help them to safety. Hurricane Matthew is expected be between a category two and three storm when it hits South Carolina, with winds of up to 100 miles per hour. The South Carolina Forestry Commission is going to initiate a burn ban on Wednesday morning. Multiple school districts have provided buses for coastal evacuations, and the S.C. Department of Transportation and the National Guard have other equipment in place. People in the Midlands are urged to stay off of the roads so those coming from the coast can get to their destinations as quickly as possible.